Even though it is winter time, what is stopping you from still grilling outdoors? 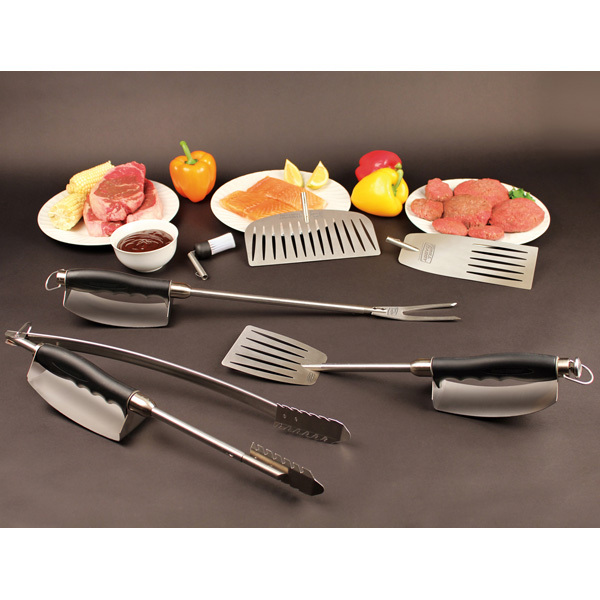 With the Grill Daddy Heat Shield 6 Piece Barbecue Tool Set you can grill any time of year. This 6 piece set is all stainless steel, which is great for all weather use. This would make a great gift for any man or woman in your family that loves to grill. This tool set comes with the Grill Daddy Heat Shield spatula, tongs, and three separate attachments. The three attachments that come with the set are the fish flipper, fork, and a basting brush. The fish flipper is wide enough to be able to grill fish of a larger size and a heavier weight with ease and without the fish falling apart in the grill. The flipper could also be used for larger cuts of beef that you need a wider flipper for. The fork is great to use for any kind of sausage, hot dog, or any meat you want to grill. The basting brush is set at a 90 degree angle to prevent the need for your hand to be too close to the grill. The silicone brush then can be removed for easy cleaning and is dishwasher safe. The tongs that come with the set are flared back to grab heavier cuts of meat. Everything in this set has a heat shield on the handles. This covers your hand preventing any burns and heat from hurting your hands. This is the ultimate grilling tool set, it comes with everything you could need to grill and cut a of meat or fish. Any grilling fanatic would love to get this as a gift. It could even make for a great house warming gift. Wow your friends and family with the best gift for grilling!